Skunks are unusual, funny, amazing, friendly animals that just have a bad reputation. 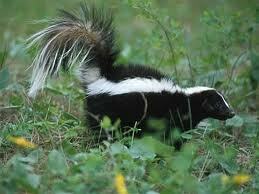 Most complaints about skunks are attributable to rumor and falsehood, and a pungent defensive weapon. Skunks learn quickly and remember well, especially when it comes to food, this often leads to "repeat offenses" and more bad press. How to discourage skunks from living under you house or deck. I have received many enquiries on how to get rid of skunks that are living under a deck or house. By screening in your deck and/or closing any openings around your residence, when the skunk returns just before dawn finding no access, he will look for a NEW HOME. Skunks were once thought to be part of the same animal family as weasels, ferrets, and badgers. Now, thanks to DNA testing, they are recognized as more distantly related to other animals and were identified as a separate family. The common striped skunk is the most well known in the United States, due to it's extensive habitat range, it's size (up to 12 pounds), and it's distinctive striped markings. Domestic skunks are commonly bred from direct lines of the striped skunk, however some cross breeding between the striped and hooded skunks is accepted as cause for the varied colors and pattern markings on domestic skunks. Wild skunks warn predators and competitors by stomping their front feet and raising their tails in full bloom. 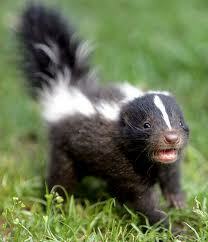 Skunks will run directly toward a threat and stop (sometimes within inches), then stomp and hiss or squeal. If the enemy doesn't heed the warnings the skunk will turn and spray. Skunks make sounds like a squealing pig, they also grunt, whine, screech, and will even chirp like a bird.. The main predators of the skunk are owls and other large birds of prey. Most birds cannot smell much if at all and are not bothered by the skunk spray odor, and the birds strike fast from above, so a skunk has little defense in their attacks. Skunks are often blamed for causing problems in neighborhoods, digging holes, spraying dogs, etc. Humans continSkunks can not jump up or knock over your garbage can ue to trap and kill skunks as nuisance wildlife. Wild skunks come out in the evening and early morning hours usually resting at night and sleeping during the day. In the winter and early spring skunks may be seen out of their dens at almost any time of day, especially before and after long periods of snow cover or prolonged cold weather. Skunks do not hibernate in winter; they do sleep more but will come out of the den to forage for food when they are not snowed in. Skunks usually take over groundhog, rabbit, or fox dens; the typical den is along a stream or ravine. Skunks will even allow groundhogs and rabbits to remain in the same den (except when the females have young kits). Skunks are tolerant of other skunks, especially their family members, often a male will den with a harem of females in the winter breeding months. Wild skunks only live a few years (maximum of about 5) due to disease, predatory birds, and the intentional and unintentional acts of man. Domestic skunks can live 15 years but 10 years is considered the maximum, the average lifespan is about 7 years. If you have a wildlife problem, it best be handled by a professional firm, such as ourselves. Then, and only then, can you have peace of mind that that neither yourself or family member will be bitten or injured and if required, a biological cleanup will be done properly if needed.